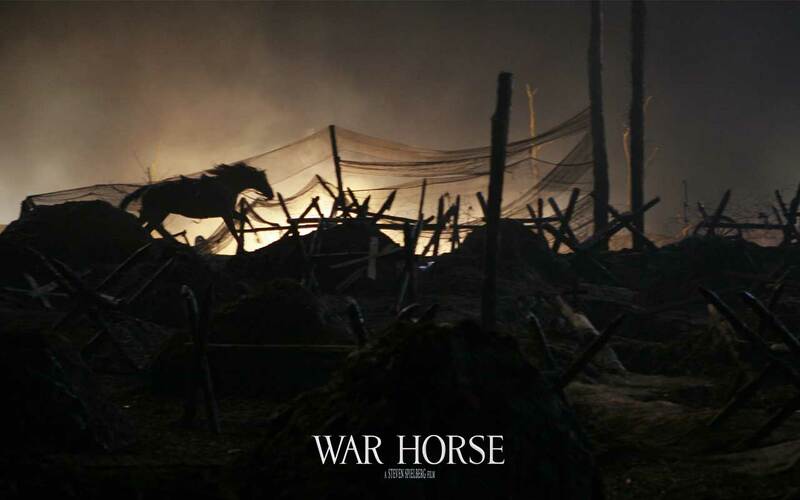 The fabulous film War Horse has been showing on Sky TV in the UK this week. But did you know that the horses playing the main equine characters had a specialist make-up team of their own? Their were coats dyed and markings added to ensure continuity between them. And for the scene where Joey, the war horse of the title, is born, a ‘non-toxic slime’ make-up was devised and smeared on to the foal playing the part. And for the really dramatic scene where Joey has fled through World War One’s muddy trenches (see picture) and then lies bleeding, tangled in barbed wire, special non-toxic make-up was used for the blood, mud and cuts on his skin. There’s a great scene in Mel Brooks’ unforgettable 1974 film Blazing Saddles where the baddies’ huge hired thug – who rejoices under the name of “Mongo” – rides into town on a bull, no less, to threaten our hero, the handsome black sheriff (played by Cleavon Little). With one blow, he knocks out a horse and advances menacingly. (Don’t worry, fellow horse-lovers, if you look closely, it’s clear a toy horse was actually used in that scene). Sadly, Alex Karras, a great actor for that part and other villains, died last week aged 77. I was watching Andrew Marr’s otherwise excellent History of the World, episode 2 – Age of Empire the other day (I’d recorded it, not sure when it was originally on) and there was a fabulous re-enactment of Alexander the Great, as a boy, taming Bucephalus, a magnificent but wild black stallion. Alexander alone had noticed that Bucephalus was afraid of his own shadow. Turning him round, the boy was able to quieten the horse when experienced horse-trainers had all failed. The horse was sleek, black and beautiful and Alexander simply leaped onto his back and rode off. But a later clip shows Alexander, now grown up and conquering people and their lands hither and thither across the world. And you can just glimpse some metal stirrups…… Alexander’s time was around the fourth century BC. Stirrups were developed some centuries later – and the first ones were simple leather loops for the big toe, certainly not full steel stirrups.